Hello! I hope that Hurricane Sandy didn't hit you/ where you live very hard. I've seen devastating photos from cities directly along the coastline and my sympathy goes out to all of you impacted by Hurricane Sandy. Hurricane Sandy was predicted to cause a fair amount of damage in Richmond which caused everyone to stock up on supplies like crazy and prepare for power outages. However, Hurricane Sandy delivered practically no damage where I live. My power stayed on throughout the storm and no trees fell down in my neighborhood. Richmond only got a steady downpour of rain for a day or two and small gusts of wind. A few branches and a plenitude of leaves fell down but that was about it (at least in the area of Richmond in which I live). We were very lucky that Hurricane Sandy didn't do more damage. Today I wore an outfit appropriate for the dismal weather. I styled it around this lovely green rain jacket to add a bit of cheeriness to my look. Psychologists say that wearing a bright color on a dreary day like today can brighten your mood and I guess I would agree with them. What do you guys think? Does wearing a bright color on a gloomy day enhance your mood? I layered a sweet, black dress with white hearts printed on it underneath my rain jacket. To finish the look, I added combat boots (they are the closest thing to rain boots that I own), a silver necklace and over sized sunglasses. Layout of my outfit for Saturday. My outfit for Saturday. It was perfect for the chilly fall weather! Beautiful skies and crisp cool fall air presided throughout the majority of the day. Rain was predicted for mid to late afternoon and evening and luckily for myself, it didn't start raining until I was back in the timeshare that my family rented out for the weekend. Closeup of my new, vintage oxfords. Favorite pair of shoes? I think yes! A photo in which I am sitting on the steps of a well worn path of the campus. The tickets to the football game! A photo taken on the Crim Dell Bridge. A quick snapshot of the football game. However, I only attended the game for like five or ten minutes before heading to the campus center with my younger sister, Missi. My outfit for my last day in Williamsburg! The weather was terrible but my mom managed to take some photos under awnings as we were checking out of our timeshare. A photo taken right before lunch. Another photo of my outfit. I am kind of obsessing over hats right now! The shape and color of this hat are absolutely delightful. A closeup of my slice of cheese pizza. Pizza will forever be one of my favorite foods! Hello! I hope that you all have enjoyed your weekend and if you live along the east coast have prepared for Hurricane Sandy. Hurricane Sandy is predicted to wreak havoc on the east coast and I am not sure how hard it will hit Richmond. Hopefully, not very hard! However, schools here are closed tomorrow so I am expecting that the power will probably go out. If it goes out, I will not have internet access nor will I want to take photos in the storm so be ready for a lack of posts in the next few days. But onto my post! This weekend, my family trekked down to William & Mary to celebrate their homecoming. Both my parents attended William & Mary along with other family members so my family typically spends homecoming weekend in Williamsburg. We headed out directly after school on Friday and spent the night Friday and Saturday. On Friday, we didn't do much; my sister and I stayed at the timeshare and watched ANTM (aren't you glad that Leila came back?) while my parents went out and caught up with some of their friends from college. My mom, sister and I started our Saturday morning out right by hitting up a few thrift shops near the timeshare that we stayed at. However, I didn't have much money to spend and just ended up buying a plaid blazer for $5 at Goodwill. I was hoping to find a few more hats to add to my collection but had no such luck in finding any! My sister purchased a few movies and a cute, color-blocked rain jacket while my mom bought a few ornate, glass plates for our lake house. After we finished shopping, we went back to the timeshare to get ready for the day ahead of us. At about noon, we drove to the campus. My family hung around a few tailgates and my sister and I eventually made our way to the College Delly to share a plate of cheese fries. They were so yummy! If you are ever at the College Delly, I would definitely recommend trying a plate of cheese fries. Missi and I then walked over to the Candy Shop and appeased our sweet teeth by ordering gummy bears and German raspberries We dined on our candy while people watching on Dog Street. The passersby kept us amused until we were ready to leave Dog Street. About an hour after watching the people on Dog Street, my mom and I headed to Crim Dell to take a few photos for my blog. We also wanted to take photos by a few of the statues but that didn't go as planned. As soon as I sat down next to the statues, a swarm of bees flew right at me and let's just say that was the end of taking photos there! My mom and I then headed into the game. A few minutes into the game, my sister, a friend and I decided to head into the Campus Center because they were too cold. There, we also watched passersby and I checked my email on my iPod. Once the game was over, my sister and I got Icees at Wawa and my family headed to Chick Fil A for dinner. Because, I am a vegetarian, I just ordered an order of large fries. My family then brought the dinner back to our timeshare to eat. After we had eaten, my parents headed back out and my sister and I once again stayed in, this time watching re-runs of the Cosby Show. The next morning (this morning), we checked out and then headed out for lunch. Almost immediately after lunch, we headed back to RVA so we wouldn't be caught in Hurricane Sandy. And that was my weekend in a nutshell! Did anyone else by chance attend Homecoming at William and Mary? Hello! Nothing says fall better than a bohemian maxi skirt and a knit sweater. I completed the look with a bold pair of flatforms. My look was very reminiscent of the 1970's what with my platforms, maxi skirt and paisley pattern all of which were huge trends in the 1970's. For these photos, I posed using a bright red lips pin as a prop. As you can see, my Yorkie, Bella, decided that she wanted to be photographed also. On another note, for this first time in months, I decided to wear my hair in a big, messy bun to school. I am lucky because my hair is crazy thick and curly so creating volume is never a problem. It only takes a few minutes to throw my hair up there and tie it down with a hair tie. No sock buns for me! It was also the last time that I will be able to wear my hair up in a bun for a while. This is so because I plan on getting my hair cut short this Friday (as long as I can get an appointment) so that I can donate my hair to Locks of Love again. More to come on that topic this weekend! Hello! I just wore a simple outfit for a day spent at school. I paired a pair of vintage black and white checked pants with gold loafers, a gold watch, a gold/pearl necklace, a light blue button down and a black faux fur jacket. Hello! Thrifting with a good friend and sipping on a cup of hot cocoa is always a good way to start your weekend. Earlier this morning, I picked up my friend, Mary, and we hit up two of my favorite thrift shops, Thrift for Life and Hope Thrift. Luckily for us, they are in adjacent shopping centers. 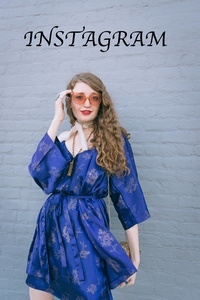 At the first thrift shop, Thrift for Life, I purchased two maxi dresses that I am planning on recreating and a bright, patterned dress that I plan on possibly giving to one of my friends depending on whether she likes the pattern. All three of my items we either red or green tags which means that each item cost me only 50 cents! Talk about a great deal. Mary was able to get a purple cardigan/shirt that was perfect for her (her favorite color is purple) and a polo. At the next thrift shop, Hope Thrift, I purchased a vintage, burgundy hat that was just calling my name. Lately, I have been obsessed with burgundy/ maroon and couldn't resist the sweet hat for $3. Usually hats don't look great on me but I love how this one looks. I am sure that you will be seeing it in the near future! Mary purchased another cardigan this time in a shade of blue. We spent the next 10-20 minutes looking for a yard sale that wasn't even happening this weekend! After repeatedly driving around and scouring multiple neighborhoods for the yard sale, we realized that the poster read "10/6" not "10/13." We then decided to stop at McDonald's so that I could get a hot cocoa and Mary could also get something to drink. Mary and I walked around the shopping center as we drank our drinks and snapped a few quick photos of what I was wearing. Today, it was finally cold enough that I could wear one of my knit scarves. I have just been dying to be able to wear one of them! :) I paired it with one of my favorite fall dresses- a black/cream/orange floral dress. To keep warm, I piled on a black blazer, orange tights and my faux Doc Martens. My fringe bag and cat eye sunglasses completed my look. Oh, and here's a big shout out to Mary for taking my photos! Thanks! Hello! Today, I wore a relatively simple look. I paired a burgundy lace dress with gold loafers, black knee high socks, bold lipstick and a fabulous vintage sweater. I bought this sweater sometime last year for a mere $2 or $3 and have never regretted it! It is by far the softest sweater that I have ever owned. That is probably true because it is made of primarily Silk and a little bit of Nylon, Angora Rabbit Hair and even Lambswool. Whenever I wear it, I never want to take it off. Stunning beading and sequins embroider that front of this sweater and give it a fun, festive vibe. This is probably one of my best yard sale finds ever! Anyone else enjoying this sweater weather as much as I am? Hello! For my outfit today, I wanted to create an artsy, sophisticated look. I planned the outfit around these edgy, skeleton tights. Oasap recently sent them to me to review and I am so glad that they did! They add the perfect amount of quirky flair to my look. To show them off, I paired them with a simple LBD (little black dress) and major heels. I completed this look by adding an asymmetrical maroon top. Instead of adding jewelry to this look, I added over sized glasses. Hey, guys! Today I have a fun DIY for you: DIY pearl trimmed sunglasses. Level of difficulty: Extremely easy. You just have to be able to work a hot glue gun. Cost: This DIY cost me nothing because I used supplies that I already had. The sunglasses that I used for the DIY are c/o Giant Vintage Sunglasses. 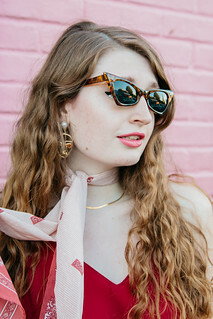 You can purchase sunglasses for this DIY at Giant Vintage Sunglasses for between $5 and $20 + shipping and handling. You can purchase pearls for this DIY at a local craft store for $5 or less. 2. Plug in hot glue gun and let it warm up. 3. 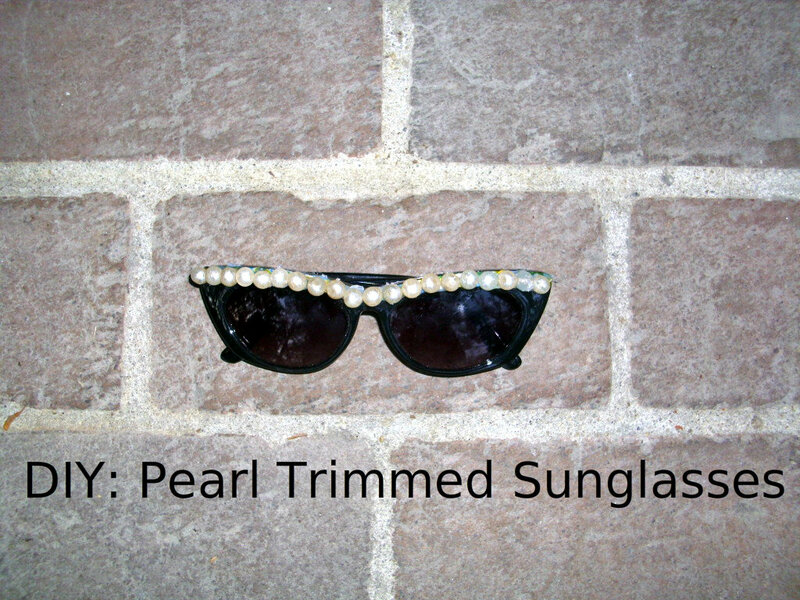 Glue pearls where ever you would like them on the sunglasses. 4. Unplug the glue gun and let the glue dry. 5. Voila! You now have a fun new pair of sunglasses. Told ya it was super easy! Hello! Today I have a great giveaway for you. 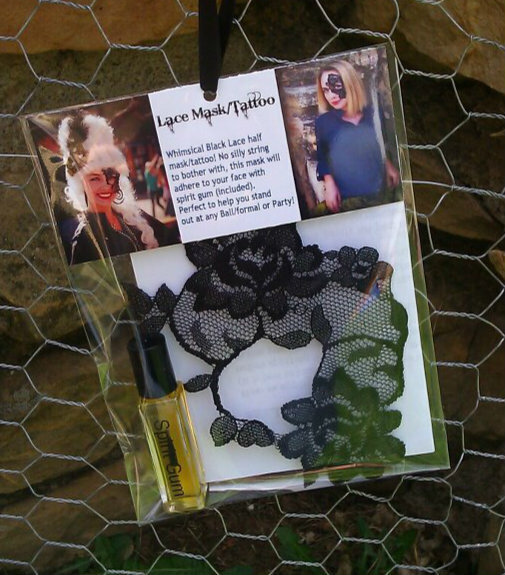 Savanna of Thats Sew Savanna has generously offered up one of her lace masks to one of my lucky readers. 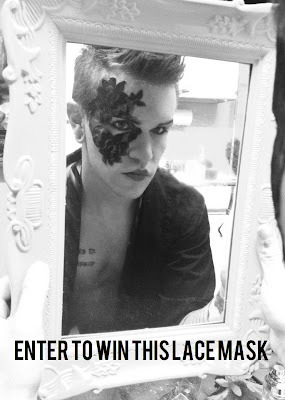 The winner will get to choose between a black mask, a red mask and a light yellow mask. These masks are great because there is no fuss in trying to keep them on. There are no strings attached or anything. The mask adheres right to your face using spirit gum. Another great thing about these masks is that these masks are reusable. Super stylish and good for the environment? You can't get much better than that! Now, you are probably wondering, "Where in the world would I wear this?" These masks are great for Halloween or costume parties. They are also great for photo shoots or runway shows. You can check out Thats Sew Savanna HERE. Now, onto the fun part- the actual giveaway! To enter this giveaway, you must have a U.S. mailing address. 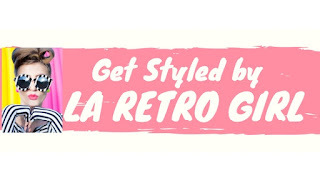 For the mandatory entry you must "like" Thats Sew Savanna on facebook and follow my blog with GFC. Once you have done this, you will be able to unlock a few more optional entries that you can complete that if completed allow you a greater chance of winning this giveaway. You must enter through the rafflcopter app below.